Frank Sinatra isn't the only one who did it his way. Irving Fields may not be as famous as old blue eyes, but he is one of the oldest entertainers still performing---making audiences laugh, cry, enjoy and remember. Friends of ours recently heard him play in New York City and tipped us off to this energized and energizing man. 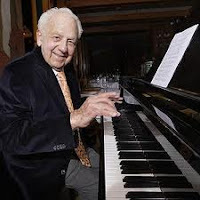 Irving is 96 years young and still goes to work, playing the piano at clubs and hotels around the city. He started playing piano when he was 8 years old and has never stopped. He has tickled the 88's at places like Carnegie Hall, the Taj Mahal, the London Palladium and the old Copa Cabana. We think Irving is a great life teacher, with lessons for all of us. Irving learned that doing the same thing, over and over, can lead to staleness, for himself and his audiences. So he often changed his repetoire, rewiring his music, to attract younger audiences and to keep older audiences coming back to enjoy new sounds and beats. In fact he is credited with popularizing the Latin beat in the 1940's and creating other themes with albums such as Bagels and Bongos, Pizzas and Bongos, and Bikinis and Bongos. His style changes not only challenged his thinking and skills but it kept him from falling into a comfort zone. And also gave his audiences new experiences and the opportunity for greater enjoyment! Is he a role model for musicians? You bet. Is he a role model for all of us? We think so! In our work with pre and post retirees, we have met many people who want to continue going strong into the future; we believe that Irving Fields shows the power and payoffs of rewiring oneself. He sets a good example of what to do right. Fields demonstrates that we all need to change with the times if we want to keep our audiences, clients, customers, friends even our partners or spouses. Learning new music has become part of his daily routine. Learning new things should be a daily routine for all of us. But is it? What was the last new thing you tried? Are you doing "the same old, same old" and wondering why you aren't getting satisfaction, or the new client,the new gig or even the new friend? People of all ages need to constantly hit their own refresh button. In the work we do, we especially believe that growing older doesn't mean growing stale, or even worse, becoming bored or boring or invisible. So keep playing in your chosen area...and like Irving, we hope you will continue to find life's meaning and purpose in whatever you do. Sometimes your life will be loud, sometimes soft, but it will be sustaining regardless of your age. This past weekend Fauja Singh completed the Toronto Waterfront Marathon. No big deal, except Fauja is 100 years old. He was born in 1911 in India. He ran as a youth but gave it up. When he was 89 his wife and son died unexpectedly. He became very depressed and was running out of reasons to live. But it was running that saved him. Singh claims his secret to an extended life is no alcohol or smoking, a vegetarian diet with lots of curries, and tea. Importantly, daily exercise is his mainstay. "I have said it before: that I will carry on running, as it is keeping me alive," he told the Toronto Marathon website. He walks or runs at least 10 miles a day. 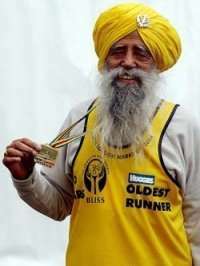 Fauja Singh is a role model for all of us. Not because he broke a marathon record, but because he was willing to try something new...or old...running. We all need to recognize that finding an activity or interest that is meaningful and purposeful will not only add years to our life, but will add life to our years. We tell everyone to REWIRE! Rewiring is trying new activities, reconnecting with old interests or finding new ones. The focus is not just doing for the sake of being busy, but doing it because it is fulfilling, interesting and fun. Having a reason to get up in the morning makes all the difference in the world as we grow older. You don't have to be a marathoner. If collecting stamps, hiking, birding, learning to enjoy opera, or any other activity that fulfills is your thing than do it. Make a committment and see the return on your new investment...in yourself! As Mr. Singh says, the first 20 miles are the hardest. After that it's a breeze.